In an era when conspiracy abounds, especially on the right with Pizzagate, crisis actors, chemtrails, and, of course, lizard people but also anti-vaxxers, and when so-called woo takes front and center in popular explorations of science — see Deepak Chopra being taken seriously, alien theories about Oumuamua, and speculation that we live in a hologram, among much more — Charles Glaubitz’s Starseeds seems just right. 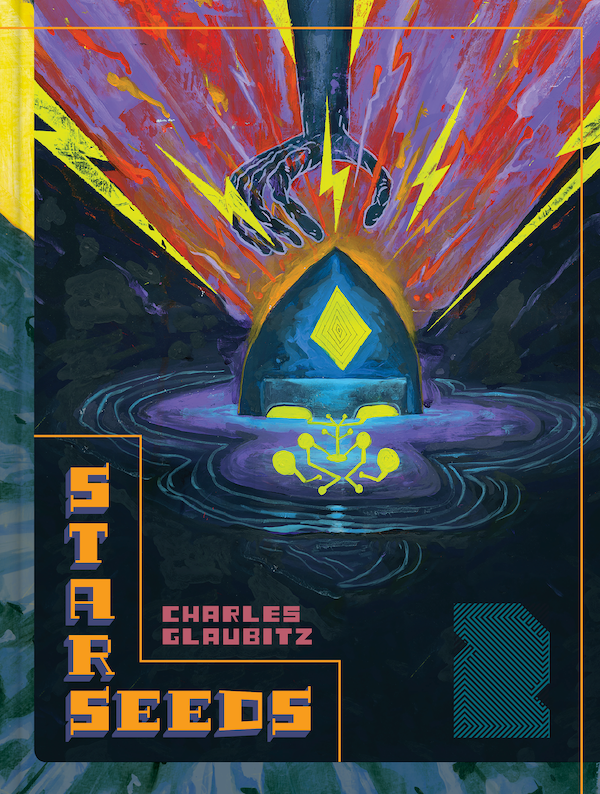 With the release of Starseeds 2, which follows up on the cosmic onslaught of the first volume, Glaubitz barrels head first into further hyper-Jack Kirby territory, but maybe that’s because since this is comics, that’s the most obvious comparison. Still, some of Kirby’s tendencies, as expressed in ventures like the New Gods, sure, but also, most especially, his 2001 comics and The Eternals, as well as his crazy Black Panther comics, seem very aligned to Glaubitz’s work. And even some non-Kirby Marvel Comics feel evoked, if not necessarily by name, especially the cosmic heroes like Captain Marvel (the 70s version) and Adam Warlock, basically Jim Starlin territory, which hint at systems beyond our understanding but never dare to venture into them quite the way Glaubitz does. Imagine if instead of first encountering Dormammu’s Dark Dimension through Doctor Strange, but completely on its own, with Dormammu himself trying to give some cohesive explanation of its history and workings, without clearly understanding that your human brain cannot completely comprehend what he is telling you, but he’s going to try to do it anyhow and really, really try to keep it simple. That’s kind of what Starseeds is like. Glaubitz is all about systems beyond our understanding, and he painstakingly sets about illustrating it all in massive books that will make your head spin and, much like the most recent incarnation of Twin Peaks, probably make you obsessed to decode. You won’t decode it, though. But that’s kind of the fun part. It’s easier to describe Starseeds by saying what it isn’t than what it is. On some basic level, it’s an ongoing chronicle of the hidden state of the multiverse through several avatars that Glaubitz has fashioned to stand-in for actions and reactions within the system he portrays. It’s a system where all time happens at once and where quantum events resonate throughout the other universes. All this unfolds in a visual tour-de-force. I imagine if you’re a person who indulges in hallucinogenics, this stuff must jump off the page in an intense way, but I guess most people could qualify it as similar to the experience of seeing 2001: A Space Odyssey for the first time. Glaubitz is skilled at created cosmicscapes the way Kirby used to, with these bizarre bursts of somethingness, no one really knows what they are, but they are part of the multiverse. Glaubitz adds design elements that pull from various religious imagery, particularly non-Christian, as well as fantasy drawings and Dungeons and Dragons evocations, but mixed in with science-related art, scenes reminiscent of early computer games, and big blasts of space something or rather booming through the panels. John Seven is a journalist and children’s book writer living in North Adams, Massachusetts. His books include ‘A Rule Is To Break: A Child’s Guide To Anarchy,’ ‘Happy Punks 1-2-3,’ ‘Frankie Liked To Sing,’ and others. Find out about all his things at johnseven.me. #Clexapocalyse: What Went Wrong at ClexaCon 2019? Send us news, tips and links! Sign up here for our very rare and special mailing list!